A sight for sore eyes is what some fans would call it. Yesterday, one of the many walking wounded made his way back to the practice field. WR DeSean Jackson returned to practice after huge injury scare last week. 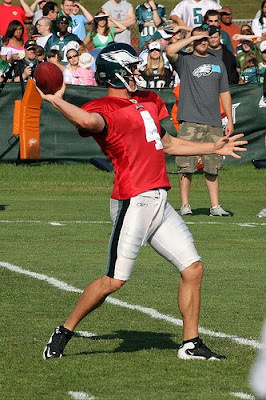 "He looked great," Kevin Kolb said after throwing him the ball during practice. "He was moving good. We didn't want to push anything." During Friday's afternoon session, Jackson showed no ill-affects of his back spasm as he not only participated in 11-on-11 drills, but returned punts as well. Granted it was a non-contact practice since the team wore only shoulder pads and helmets. Kolb and Marty Mornhinweg made sure to test Jackson’s back, as they made him run passing routes, which forced him to open his hips and body. It appeared as if Jackson was not completely at 100 percent, but should be ready to go for the Eagles preseason game next Friday against Jacksonville. On another note, Jackson is still refusing to talk to the media. One has to think he is tired of being asked about his contract situation. Or maybe he is mad that the media that they painted him as the poster boy for getting rid of and agitating former Eagles QB Donovan McNabb. Despite the good news on the wide receiver front, the Eagles received potentially horrible news today at center. About 30 minutes into the morning practice, Nick Cole left the field with what Andy Reid called a sore knee. After Cole left the practice, he was seen talking with head athletic trainer Rick Burkholder on the sidelines and then walked into the indoor facility. While he walked under his own power, he had a noticeable limp (left knee). Before the injury, Cole was receiving a majority of the reps at center andwas expected to replace injured starting center Jamaal Jackson. With Cole out, Mike McGlynn will see his playing time and reps increase. Still, he will have some competition as A.Q. Shipley returned to practice, but he has running with the second-team offense. on the practice field for more than two practices. Now with Cole hurt, they lose their most versatile offensive lineman and key backup. Cole gives the Eagles the flexibility to shuffle lineman around to different spots along the line and is an insurance plan incase Andrews never returns to form. Hopefully, Cole is not out too long. Otherwise, the Eagles will only have tackles Jason Peters and Winston Justice as the only returning starters from last year’s squad. Should be interesting to see how Kolb fares in the first preseason game with a makeshift offensive line. As of a couple of days ago, the Eagles offense seemed to be rolling and hitting their stride. And then, the Eagles held their annual Flight Night event and they have not been the same. At Saturday's morning session, quarterback Kevin Kolb struggled mightily. Kolb had Donovan McNabb like accuracy problems as he misfired all over the field and threw two interceptions (Quintin Mikell and Dimitri Patterson). "From the offensive stand point, we've got to do a better job," Reid said. "We're going to keep doing that, keep getting better as we go." Of course one of the reasons for the inaccuracies and lack of timing could be the fact that the Eagles are missing two starters on the offensive line (Andrews just coming back from an injured shoulder and Cole left today) and WR Jeremy Maclin still being sidelined. "You can't have the interceptions, you can't have the sacks, the quarterback's running around way too much with the pressure he's getting right there, so we've got to take care of that," Reid said. "When they're running the football they're getting big yards there, so we've just go to get the throwing part of it down." On the other hand, there is a positive outlook. Maybe the defense is gelling faster than anticipated. Linebackers Stewart Bradley, Akeem Jordan and Ernie Sims finally gives the Eagles the athleticism, cover ability and attitude that has been missing from the linebacker position for the greater portion of the last five years. Defensive ends Trevor Laws and rookie Brandon Graham have rejuvenated a defensive line, which is wrecking havoc on the quarterback on a constant basis. More importantly, rookie free safety Nate Allen is an adequate replacement for the departed All-Pro Brian Dawkins. "The positive, I think, is the defense is playing well," Reid said. "That's a positive. Everyone on the offensive side, we need to get better. We continue to push through this and normally what you see is offenses come together a little bit later than defenses, if you do have a good defense." Nonetheless, fans should sit tight and not overreact to the offensive woes because the unit has too much talent to consistently play mediocre. With the amount of injuries the Eagles offense as sustain so far (Jackson, Maclin, Mike Bell, Andrews, Cole, Herremans and Jackson), it is not hard to see why the offense is slightly behind the defense. Still, for a very young defense tobe playing at such a high level already, it should take some of the pressure off Kolb's shoulders. * Expect the Eagles to run more two-tight end formations this upcoming year. In practice, (TE) Cornelius Ingram is gaining more confidence in his surgically repaired knee each day. 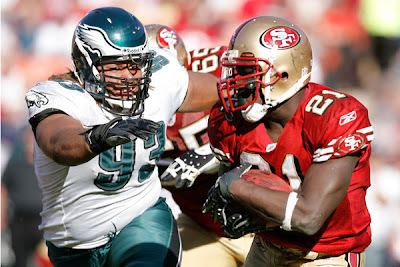 Today, Reid had him and Brent Celek on the field with the first unit. With the athleticism that Ingram provides and Celek's emergences in 2009, the Eagles offense could be even more dynamic then last year's record setting offense. * DE/DTs Trevor Laws and Daniel Te'o-Nesheim continue to put on a show at training camp. Laws has resurrected his career, which is good since he was on the chopping block if he did not improve drastically. The rookie has also been impressing defensive coordinator Sean McDermott so much that he is now the starting defensive tackle on the team's dime and nickel packages along with Laws. If Laws has a coming out party this year, it might mean that Mike Patterson or the soon-to-be free agent Brodrick Bunkley could be gone. * Ellis Hobbs had a particularly hard day today. Hank Baskett scored a touchdown on him and (WR) Riley Cooper beat him multiple times over the middle ofthe field. It is amazing that two days ago Reid said it was his job to lose and then he comes out and has one of his worse practices of camp. Although Reid still managed to praise his corners, while they were beaten quite a few times in drills today. * Best of friends? Linebackers Stewart Bradley and Ernie Sims seem to have great on the field chemistry. Each flies around the ball and steps up when the other falters. It is good to see the linebacker position becoming a strength of the Eagles defense after so many years of being neglected. * Finally the real (RB) LeSean McCoy showed up in practice. 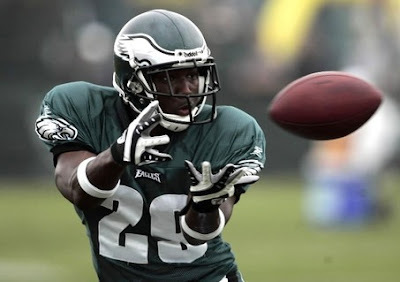 The Eagles lined up McCoy so that he could have one-on-one match-ups with the linebackers like they used to do with Brian Westbrook. Like Westbrook, McCoy was too shifty and nimble for the linebackers as he time and again juked and made his way into open space.